Wakeboarding has only been around for about 30-years, but it originates from some of the most traditional, and oldest forms of water and snow sports. Combining the best attributes of water skiing, snow boarding and surfing, you get the best of all worlds helping bring out the enthusiast in all of us. Giving way to one of the biggest rushes in water sports filled with adrenaline, speed and big air tricks. We’ve seen many changes with wakeboarding over the years since being introduced in Australia back in the 80’s. Starting out called skurfing which consisted of a handcrafted board, no bindings and a rider being towed behind a boat, it’s since become that’s now technologically advanced, with bindings and the option of being towed behind a boat or tow rope attached to a suspended cable above the water. Wakeboarding has since spawned other forms of water sports including wakeskating and kneeboarding which share many of the same similarities. Boat – similar to water skiing, the rider holds onto a rope with a handle and is pulled around on the water by a boat. Due to access, this is the popular type of wakeboarding. Cable – cable parks are a more controlled environment specifically setup for wakeboarding and other forms of water sports. Here, a rope with a handle where the rider holds on to is suspended from a cable mechanism. The cable mechanically moves around a circuit where ramps and other obstacles provide a launching pad for tricks and other stunts. Cable wakeboarding is becoming increasingly popular with more cable parks emerging. Countries like the UK and Australia have a fair amount of cable parks with more popping up in the US, especially in the south and southeast. For a great a great resource of wakeboard cable park locations, check out US Cable Wake Parks which details parks in the US and internationally. Intermediate – intermediates can use both rocker types or a hybrid and often look refine their skills while trying out different stunts. 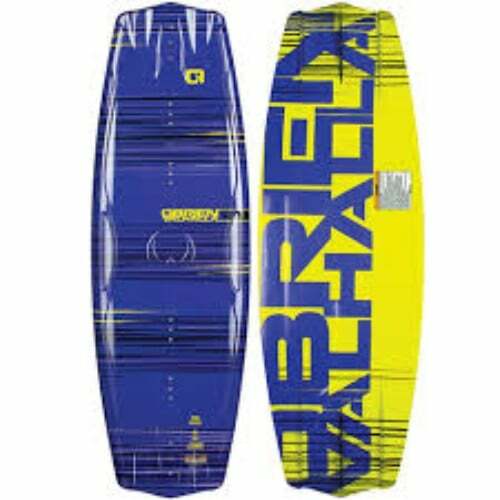 Advanced - advanced wakeboarders start to look for 3-stage or aggressive continuous rockers which allow you to take on harder jumpt, stunts, and other big-air tricks. 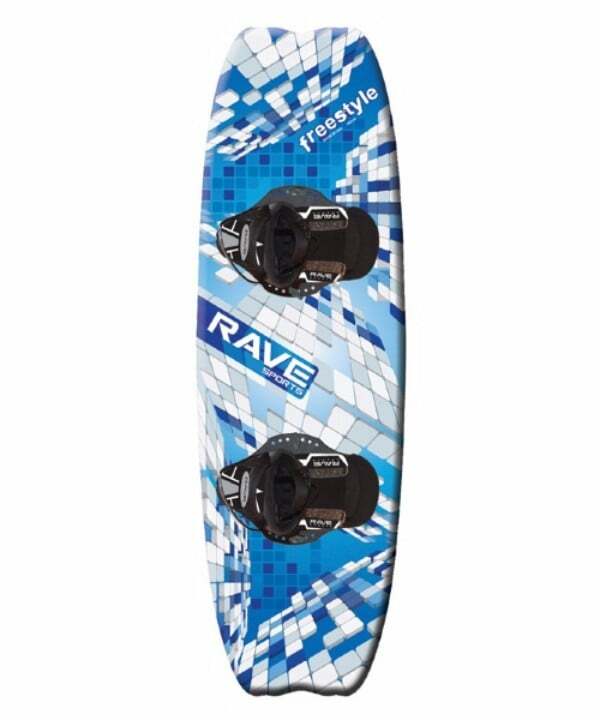 A wakeboard rocker ultimately helps define the user’s riding experience and can easily be seen while visualizing the wakeboard on a flat surface, on its side. 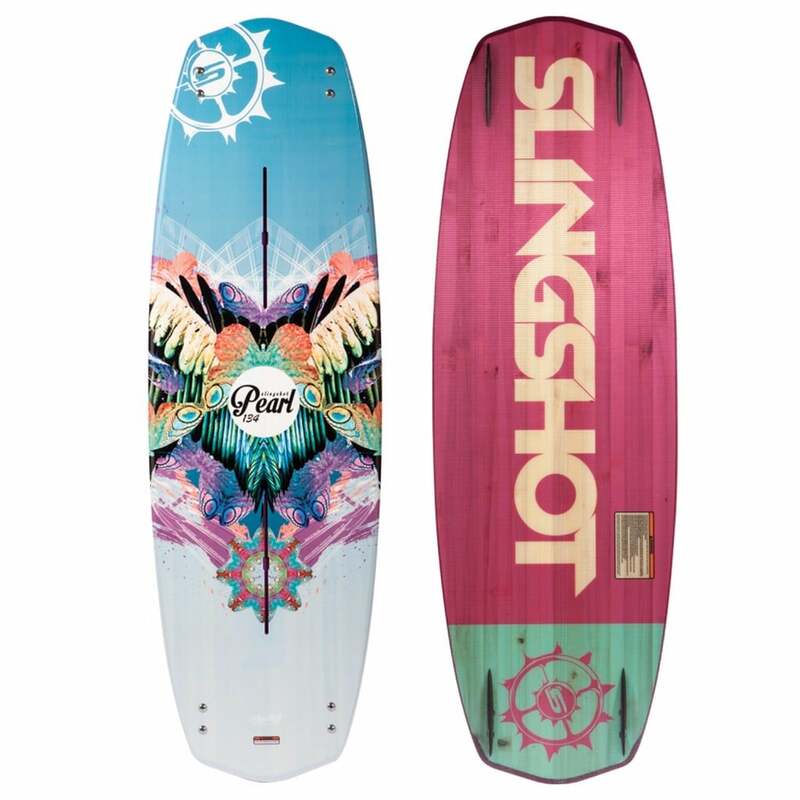 It’s defined as the difference in shape between the tip and tail and the center of the bottom of the wakeboard. 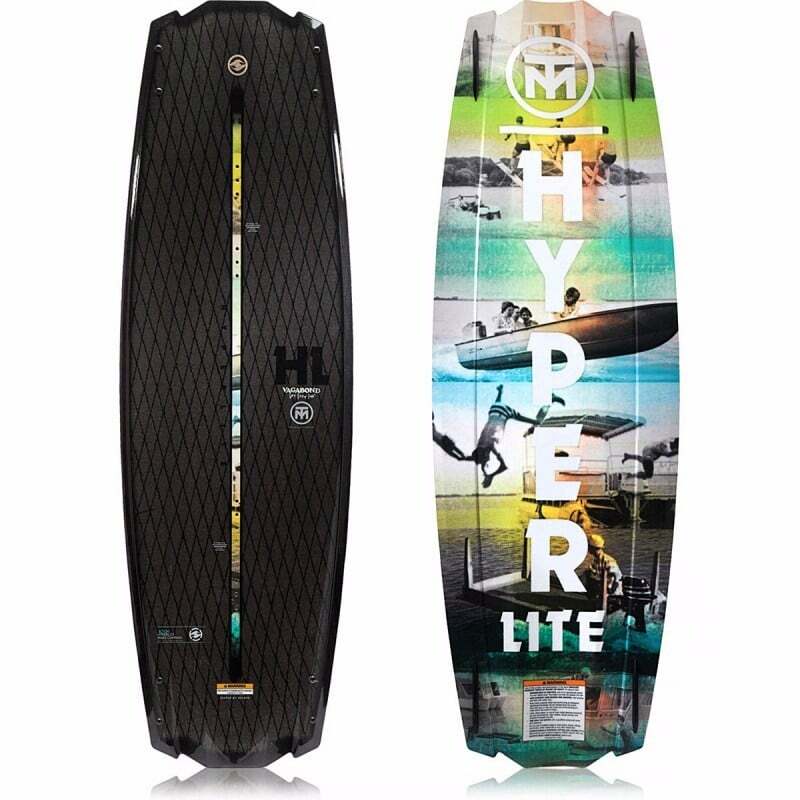 There are two main types or wakeboard rockers with a 3rd being a hybrid of both which are detailed below. 3-Stage rockers feature three different planes between the tip and tail of the board and provides a greater release while coming off the wake. The downside is less control, poor carving ability and slower speed. 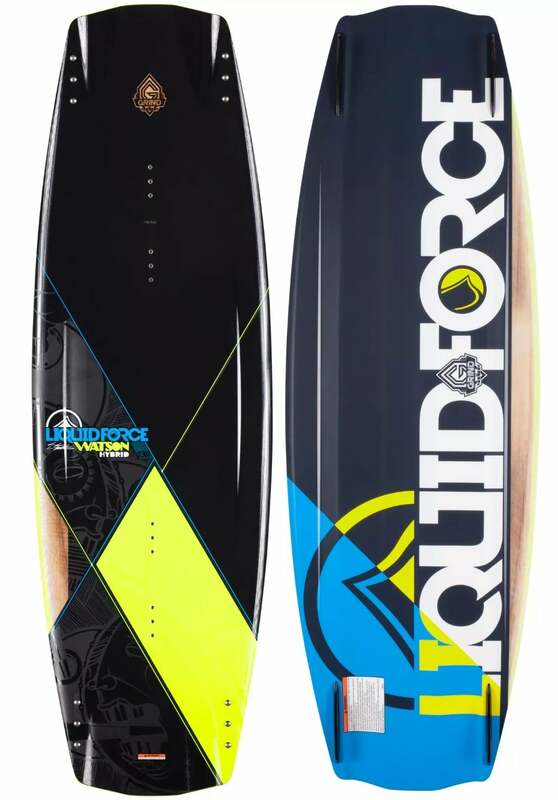 Due to the flat spot under the board, landing are rougher and it takes longer to get up speed compared to a wakeboard with a continuous rocker. Just like it sounds, a continuous rocker features a curved, smooth shape. This type of rocker provides a smoother, faster ride and makes it easier to hook turns on the drop of a dime. 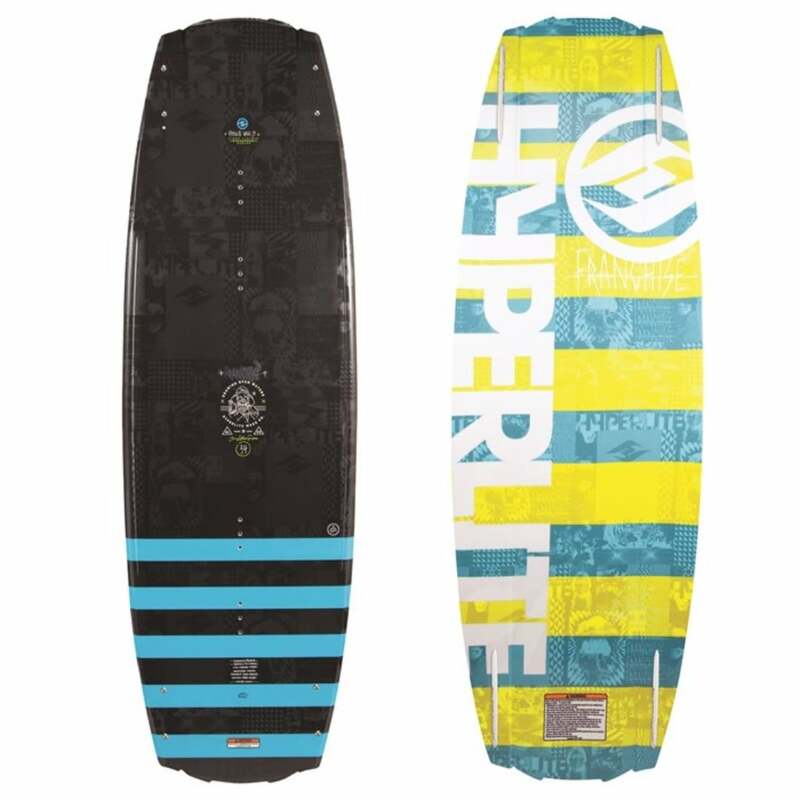 Wakeboards with this rocker line provide a predictable pop, or launch off the wake and are especially great at carving through smooth water. A hybrid rocker is a combination of both a 3-stage and continuous rocker offering the best of both worlds. Depending on the brand of the board itself, the rocker will offer subtle differences which may resemble one type over the other just a bit more. One of the newest rocker, or profiles introduced is a camber. The design resembles that of a snowboard and traditional ski and allows you to rid more centered on the board than a 3-stage rocker continuous rocker line. This helps alter your weight distribution and provides the rider with more control. 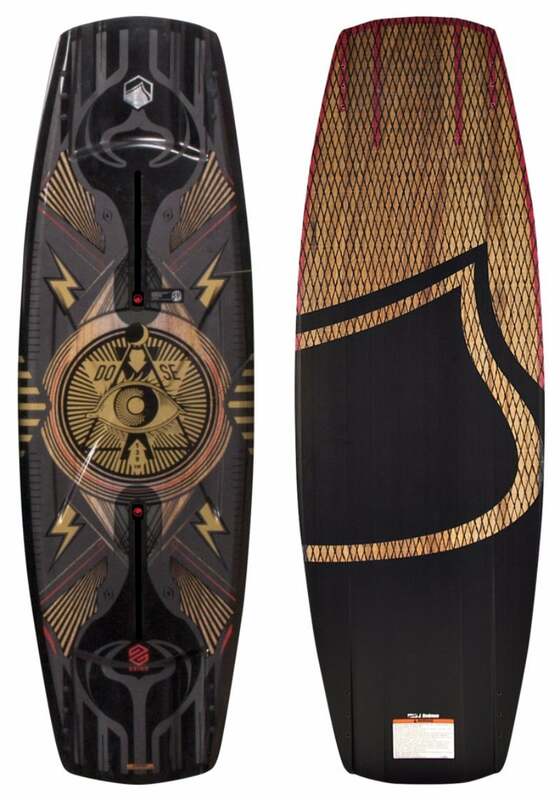 Channels – channels on the bottom of the board have a similar effect of longer fins that help reduce tension while absorbing much of the impact before the wakeboard itself lands on the water. Concave – concaves are dents in the bottom of the board that helps the board sit higher on the water. The dents which are located at the bottom of the board allows the front of the board to lift out of the water and help reduce suction. Featureless – board without channels or fins; they’re literally featureless. This leaves the performance of the board solely up to the rider, rocker, shape and setup of the fin and makes it easier to customize the ride itself. 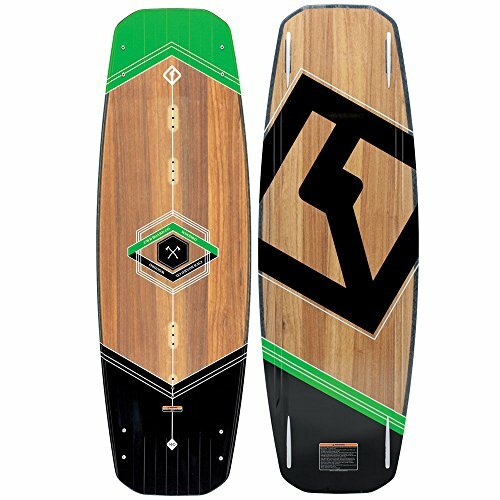 V-Shape – V-shapes are often seen in wakeboard with a 3-stage rocker to help make landings softer. This resembles boats with v-shaped hulls which helps stabilize and makes for a smoother ride. 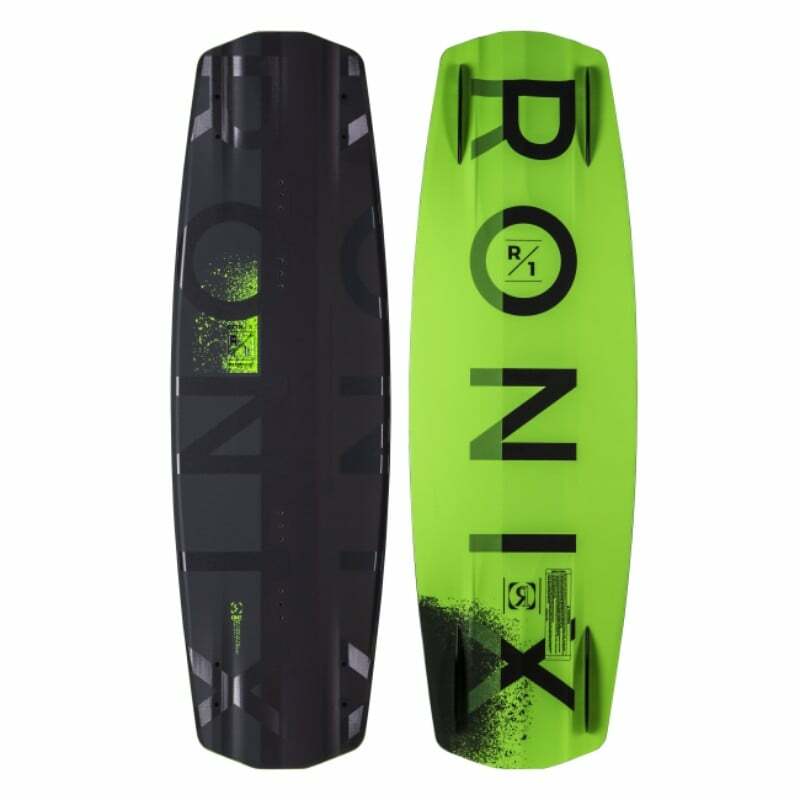 Wakeboard fins provide various levels of grip between the water and board itself. The amount of grip differs as there a multiple fin setup, amounts of fins and placements. Fins aren’t a necessary component with wakeboards as they naturally track through the water due to design of being longer then wider, but they do provide better traction, which means more control. Below, are the most common types and placement setups of each. Removable fins are just that, they affix to the board with screws and can easily be removed. These are highly popular with families and those who may share their board with someone else, each with different riding styles and experience levels. Being removable, these boards allow the rider to customize their ride by moving, switching or not using the fins at all. Wakeboard bindings, also called wakeboard boots connect you, the rider, to the board itself. The bindings lock and unlock onto the board itself with subtle difference depending on the rider’s preference including flex, fit, how they attach, closure system, and the type of binding itself. Like the flex in wakeboards, this describes the stiffness once your feet are secured inside the boot. Flex can differ significantly from brand to brand which ultimately depends on the rider’s preference. Boots that are stiffer provide greater ankle support while boots more flexible tend to be more popular with experience wakeboarders which make it easier to tweak the board for stunts and other tricks. The fit of wakeboard bindings is the same as traditional boots; tight enough to provide good ankle support, but not too tight where it causes pain or reduces circulation. Depending on the style and brand of the boots, they’re either sized based on a range or single sizes seen in higher-end bindings. Closed-toe bindings are shoe specific and don’t give you the versatility like their open-toe boots. These tend to be on more expensive wakeboards and offer more rider control and aid in keeping your feet warmer, something to consider if you’ll be wakeboarding during the colder months. Open toe bindings are a great option for families or a spare wakeboard where multiple people may use. Due to the open-toe, those with slightly larger feet then the range of the boot itself can typically use it the same as they give you a couple of additional inches. Both open-toe and closed-toe wakeboard bindings offer the same ankle support with the only difference being the toe itself. System bindings resemble snowboard boots which are higher in the back and ratchet-like strap that goes across the ankle and foot. This type of binding offers leg support including ankle, heel and foot. Below are some simple tips before buying, mounting and wearing wakeboard bindings. All brands use the same size ¼-inch thread, but not all size screws are the same length. Boots and wakeboards are interchangeable as wakeboard boots can fit any wakeboard. If having trouble getting a boot on, wetting the inside of the boot and/or your foot will simply resolve this. If still having trouble, consider a biodegradable lubricant. When buying a wakeboard, size really does matter. 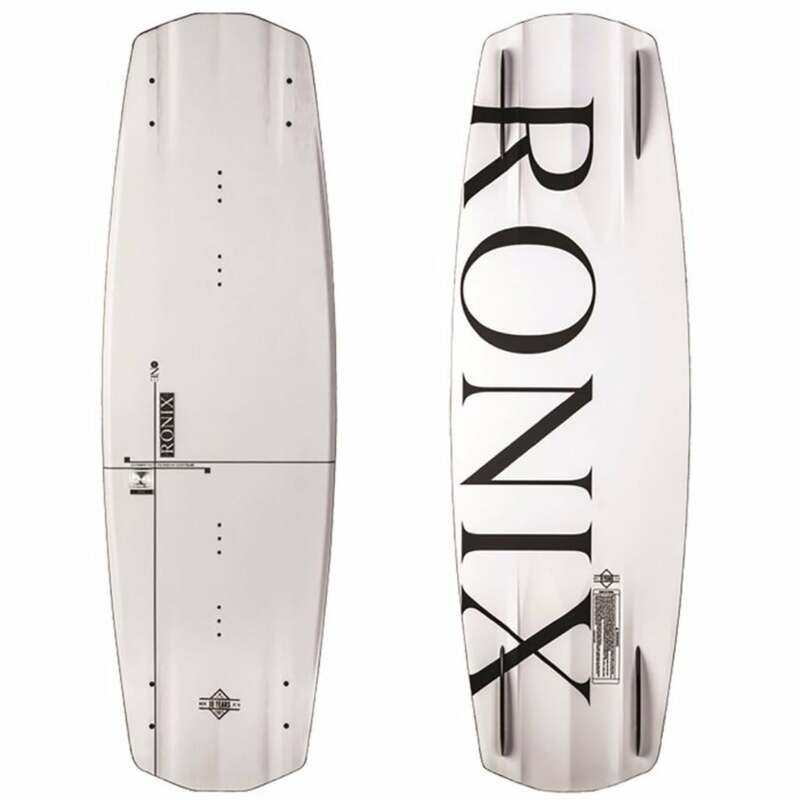 The size of the board is the singular most important detail when buying a new board and is based on the rider’s weight. Below, we’ve detailed a size chart that works for both males and female. When in doubt, a good rule of thumb differs between experienced and inexperienced users differ when choosing a wakeboard. Its better for beginners to choose a size larger then smaller as bigger boards provide a more stable ride. Larger boards are slower and provide more surface area underneath the rider helping make landings softer while minimizing edge catches. On the other hand, more experienced wakeboarders can consider smaller boards which tend to be faster and makes for more aggressive edge to edge transitions. Smaller boards are easier to control then larger boards, but the risk is greater for harder landings due less surface area. We’ve created the most comprehensive, unbiased wakeboard reviews that nobody can touch. After months of research and a whole lot of trial and error, we’ve introduced reviews broken down in each of the categories listed below based on experience level, gender, age, brand and a whole lot more. Feel free to browse our reviews and as always, if you have any questions don’t be afraid to let us know.